I’m always looking for ways to provide healthy, organic feed for my flock without busting the budget. Organic feed isn’t cheap and the cost of keeping chickens keeps increasing. 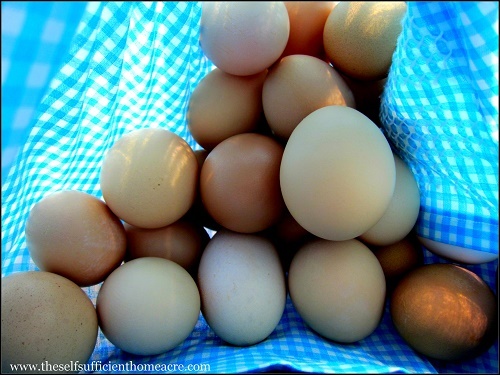 This winter I calculated that our organic, home raised eggs cost about $5 per dozen. It always costs more to feed the flock in the winter and the hens don’t produce as many eggs. There are some ways to increase production, but in our northern climate I know we will pay more for eggs in winter. However, I really wasn’t prepared for the sticker shock when I actually added up the feed bill and divided by the number of eggs they are producing. This post contains affiliate links for products you may find useful. I earn a referral fee or a small commission if you purchase products through these links. Please see disclosures below. MICRONA Poultry 6×10 Grit Calcium Carbonate provides your flock with grit for good digestion and calcium for strong egg shells. Available through Azure Standard. So I’m on a mission to reduce the cost of feeding my flock. I’m guessing that most chicken enthusiasts would like to cut back on their feed bill too. So here is my list of 12 ways to reduce the cost of feeding your chickens. Not all of these ideas will work for everyone, so choose the methods that make the most sense for you. Raise sunflower seeds for the flock. Keep breeds that need less feed. Try mixing your own chicken feed. Raise sprouts and fodder for your flock. Keep a compost pile in the chicken pen. Feed table scraps, but don’t give moldy or rotten foods. Cook damaged eggs and feed back to the flock. Keep a garden and feed produce to your birds. Let your flock till the garden in the spring and fall. Raise your chickens on pasture or let them free range. Grow your own grains, sunflower seeds, and field peas. Reduce the size of your flock by culling old laying hens. Are These Methods Fool Proof? I’m not really sure that anything is fool proof, but many of these ideas will at least help to reduce your feed bill. When you combine methods, or use all of these ideas, you might be able to reduce your chicken expenses considerably. Let’s take a closer look at some of these methods. The White Leghorn (in front) is more feed efficient than the Buff Orpington . Dual purpose breeds generally consume more feed than laying breeds. If you don’t intend to eat your laying hens when they are past their prime, consider keeping a more feed efficient breed such as White Leghorns, California White, Red Star, or another laying hybrid. You can also raise breeds that are active foragers. These birds will find more of their own feed when given a good sized pasture or allowed to free range. In my flock Americaunas and Easter Eggers actively forage for their own grub, making them one of my favorites. They also lay quite well at around 5 to 6 months old. Weighing sunflower seeds for home made chicken feed. If you have a source for whole grains, field peas, and supplements for your chickens, you might be able to mix your own and save some money. Whole grains are more nutritious than feed that has been ground in advance, and may be less expensive. Poultry Nutri-Balancer helps provide the nutrients laying hens need. Available from Azure Standard. I began mixing my own feed last year and found that my hens would not consume enough oyster shell on the side to supply the calcium necessary for strong egg shells. I started using Fertrell Poultry Nutri-Balancer mixed in with the feed to supply my flock with calcium and all of the micro-nutrients they need to lay well. I recently began sprouting wheat grass for my flock in an attempt to reduce the feed bill and give them green feed for deeper colored yolks in the winter. The ducks go crazy for the sprouts and most of the chickens like them too. I haven’t been feeding them sprouts long enough to come to a conclusion about feed costs and nutritional value, but everything I’ve read points to increased production for decreased cost. Sprouting wheat for your flock is a great way to give them some greens in the winter. Available from Azure Standard. I recently watched a video produced by permaculture guru Geoff Lawton about a gentleman who raises his chickens on nothing but compost. I’ve been tossing all table scraps, cracked eggs, egg shells, and garden ‘waste’ into my chicken pen since I started keeping a flock. I can definitely say that the chickens make the best use of my compost. They eat what they like, plus the bugs that are attracted to the leftovers. I just wish I had more compost! The chickens eat a lot less feed in the summer when my garden is in full swing. Anything that has been ruined by bugs, is over ripe, or we just can’t use fast enough goes to the flock. The ducks are crazy about cucumbers too. Of course, the peelings, etc go to them too when I can, freeze, or dehydrate my produce. This spring I plan to fence in my garden so that the chickens and ducks can work up the soil and eat some of the grubs before I plant my seeds. I will probably ban them from the garden before anything is planted. If you have the space on your property to raise wheat, oats, barley, field peas, and sunflower seeds you can really save a great deal on you feed bill. Of course, there is the cost of seed, fuel, and equipment but you should still come out ahead. 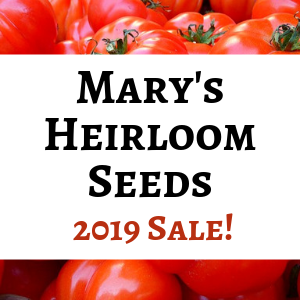 You can reduce the expenses further my raising heirloom grains by hand instead of buying seed each year and keeping a tractor for planting and harvesting. Poultry raised on pasture can forage for much of their own grub. Note the large composting area in the middle of the pen. If you live in an area where your chickens can safely free range during the day they will search for seeds, grass, bugs, and weeds. This variation in their diet will keep them healthy, happy, and well fed with oyster shell and layer feed on the side. Not everyone can let their flock free range due to space limitations, predators, or neighbors. Our property is not set up for free ranging the flock so I have a large pasture that keeps them out of the neighbors yard and the road, but allows them plenty of room to forage. Scratch grains are a nice treat for happy hens…but don’t overdo it! Available from Azure Standard. This will be a tough one for many chicken enthusiasts who view their birds as pets rather than livestock. Too many treats will increase the cost of keeping a flock, and so will keeping older hens that aren’t laying well anymore. Hens that are overfed get fatty tissue in their abdomens and this leads to decreased egg production. So be sure that you aren’t over feeding your flock or giving them too much corn, sunflower seed, or other high fat foods. They also need daily exercise to stay healthy and in good laying condition. Once your hens pass their prime laying years, you may wish to cull them from the flock and make a nice pot of chicken soup. This won’t go over well for people who name their hens and consider them pets. When you first get your chickens you need to make a decision about whether or not you are willing to keep feeding your hens throughout their retirement years. Keep in mind that a hen can live to be 10 years old when properly cared for. But they will only lay really well for about 2 or 3 years. If you don’t want to feed non-productive hens, I suggest you ditch the pet names and consider them livestock from the very beginning. Make sure the whole family understands that these chickens will be eaten at some point and don’t get attached! Do you have ways of reducing your feed costs that aren’t mentioned here? How much do your eggs cost? 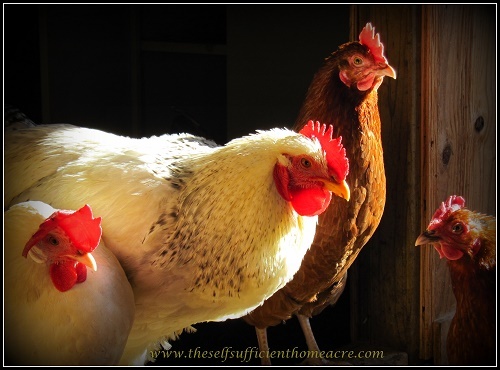 Are your chickens pets or livestock? I enjoy reading about how other people raise their poultry so please share! » Can You Really Save Money With Coupons? There are a number of insects that can easily be raised…not needing dead animal carcasses…has anyone tried those to supplement the feed, and give chickens the “thrill of victory”? Maggot Buckets, not for the faint of heart, but very effective. Can use any roadkill, or dead animal parts, or if you are slaughtering your own animals, you can add the offal or other parts you don’t have a use for. Take a 5 gallon bucket and drill holes about 1/4″ or so, just big enough for maggots to crawl out. Put dead animal in bucket, hang from a branch about 3-5′ off the ground in the chicken area. Wait about 2-5 days depending on outside air temp (must be warm season, doesn’t work in the depth of winter). You’ll start to see maggots fall out of holes. I deliberately shake the bucket once a day and maggots fall out in piles. Chickens and ducks love them. Very high protein and will boost egg production immediately. Thank you for sharing. I have read about this and considered trying it, but we are pretty close to the neighbors and I was concerned about the scent! Do you know where to get feedless eggs or feedless chicken or lamb ,so the feed is not poison with other deceased animals? Look at the packages for eggs, chicken, etc that has been fed a vegetarian diet. I do see that label at the store sometimes, but I don’t know if they are available in your area. If you just put the light on a timer in their coop, you may have to wait a couple of weeks for the increased light to affect their production. The earlier in the fall that you increase their light, the less time it takes to trick them into laying more. You don’t mention how old your hens are or if any of them might be going into a molt. If they are somewhere in the range of 1 – 1 1/2 years old, they could be getting ready to molt. During molt they stop laying eggs and put their energy into growing new feathers. The higher protein feed is helpful, but you may want to give them a little cracked corn or some black oil sunflower seeds in the evening to help them stay warm at night. Best wishes! I hope this helps. There is a lot of info about adding protein to the chickens diet. All meat scraps and veggie scraps go to my chickens. Mine were not laying for 2 months. I was away for a month, and they stopped laying so I increased the light in the coop, just a regular led bulb, and they have had the leftovers from our suppers, like ham and duck. Out of 16, I’m up to 5 eggs a day now. That being said, I have 6 birds that exceed 3-4 years old. They were my first so pets. The others were more for eggs. I was raised with having chickens, and we never did anything special with our chickens, but seems I have more struggles keeping them laying than my mom did. Some of it depends also on what time of the year your hens hatched out and grew up. I recently read that pullets hatched in winter for summer laying often stop laying their first winter, whereas pullets hatched in spring are more likely to lay through the winter. I haven’t done a lot of research into this or compared notes to see if my experience has been the same. Right now I have zero chickens…so I’m actually buying eggs for the first time in ages. OK this probably goes against everything else on here, but my chickens were not laying for about a month. I heard from an old timer to feed them some dry dog food. I tried this yesterday. I ended the day with 7 eggs. I tried them on my boys this morning, and they loved them. I can not eat eggs currently or I would have tried the eggs myself. I’ve heard other folks say they give their chickens cat or dog food. Yes, not cheap, but maybe there is a higher protein and/or fat content that helps to jump start their laying. 🙂 Thanks for sharing! Great list! Thanks for sharing! Two other things we do: 1) We ask friends to save us leftovers they no longer want (on the cusp of going bad). 2) We’ve found local bakeries that will give us expired bread (for next to nothing) – here’s a link to a post about our adventures with our first bread haul! http://walterandlila.wordpress.com/2014/02/10/bread-circus/ it amazes me what one can get for cheep or free if you only ask! Great article as usual Lisa! I really appreciate your posts. One other idea that I’ve seen but haven’t yet had the opportunity to try for producing your own chicken feed is just to have a few boards or small sheets of plywood that you lay down on the ground in your chicken yard, then every few days or so you flip the board over to reveal all the worms and potato bugs and other critters that have congregated under it and the chickens go crazy. You can move the board to another spot and keep rotating the bug buffet around your chicken yard! Excellent suggestion! I have done this in my garden, but the flock isn’t allowed in there very often. So putting something down in their pasture is a great idea. I have been thinking about putting my pumpkin patch in their pasture, but I need to kill the grass and get a new bed started. The best way to do this is with cardboard, plastic, tarps or something of that nature. Then I can flip them over and let the birds do the munching! Great idea Elizabeth, I frequented this blog exactly because he is filled with ideas interesting. A small idea, more another small idea, more another small idea, that becomes a brilliant find. Thank you! I love articles like this. Keeping feed costs down and doing it without buying the GMO junk is a passion of mine. Thing one: With those dead possums (or any other dead critters), you may want to look into doing some fly “conversion.” Rig up a 5 gallon bucket, line it with straw, and drop the carcass into the center. Drill small holes around the bottom and some slightly larger ones up top. Flies come and lay eggs, the maggots feed on the carcass, then , when they’re ready to pupate, they drop out the bottom of the bucket and into your chicken pen (or you can set up a collector to make sure none go to waste). There are a ton of tutorials around the net on making your own fly composter or even a black solider fly bin. I’d also recommend Harvey Ussery’s book on the Small Scale Poultry Flock. It’s chock FULL of good ideas for reducing feed costs. Keep up with the articles! I always enjoy reading them. Thanks, Jeff! I have read about the fly incubation set up. This might work well for folks who don’t have neighbors close by, or a hubby who hates the smell of ‘farming’…lol! I haven’t tried it for those reasons and had kinda forgotten about it…so thanks for sharing! Hello Lisa, I sow every year some plans of pumpkins for my hens. Pumpkins preserve easily and the hens adore it. For the hens, my favorite variety is Dill Atlantic Giant. So I cut the costs of food of half. Two or three dozens pumpkins = a minimum of 1 1/2 tons of food easy to store. Do I have the right to put an an internet link? If no, sorry. Good end of the evening to you. Great photo, Pierre! My chickens don’t like pumpkins unless I cook them…picky little things. But the ducks adore them! It’s funny to watch a duck eat a pumpkin. 🙂 I should grow more pumpkins and cook them for the flock…great idea! Thanks for sharing the photo…awesome pumpkin! Your yard looks very productive and lush! 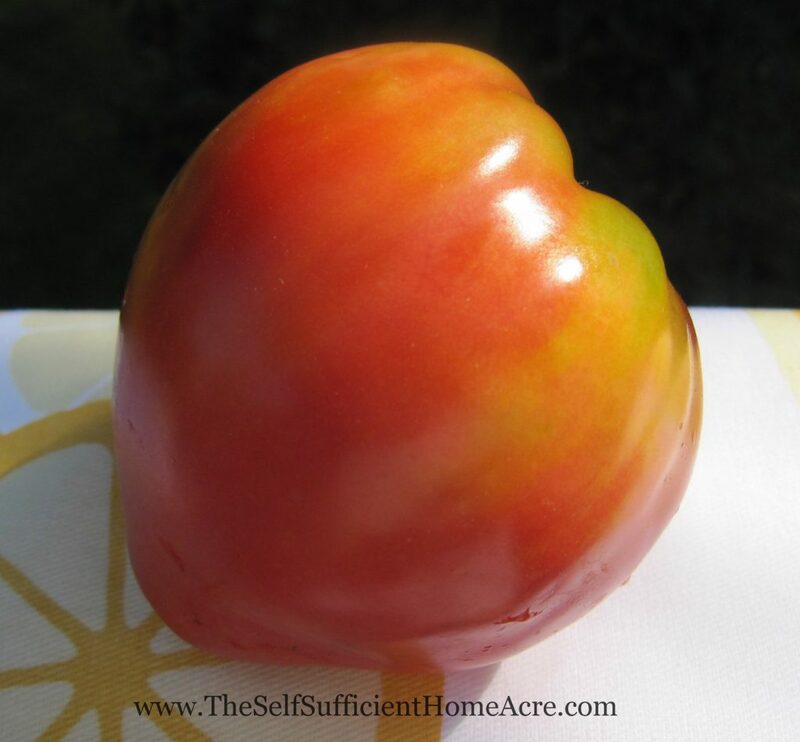 What hardiness zone are you in? Hello Lisa,my hardiness zone is zone 4, and yes my yard is very productive. Year after year I improve or maintain the earth quality with compost, hen manure ans pig manure. Hen manure is upper to chicken, cow manuret or any to fertilize the ground intended for tomatoes and peppers. The fertilizer of hen contains much more calcium, and tomatoes and pepper love calcium. Your chickens don’t like pumpkin? They are too much spoiled 🙂 I cut pumpkin in two and the hens eat everything but the peel, When they ended to eat, I have something which looks like a leaky soccer ball. Anyway, pumpkin is low in protein and serves only as complement.The food for laying hens seem less expensive in Canada. I pay only $9.00 for a bag of 50 lbs. It is not certified organic but I buy directly of a local producer who makes himself his mixture of grain for her chickens. Tomorrow I am going to put on my page Facebook (3/4 d’acre d’auto-suffisance) of the photos of my seedlings. I am fairly moved forward. I hope that these photos will stimulate other people to have a kitchen garden. In my head and in my heart, the beautiful season is already begun. Mars in a few days and by April 15th I transplant a part(party) of my tomatoes in a tunnel. Thus it is for soon. I liked your facebook page and saw all the great photos of your yard and garden…Wonderful! It does my heart good to see photos of gardens this time of year. I’m still working on producing enough composted manure to add to all of my garden beds too. I recently switched to organic chicken feed. The manure composted before I switched won’t grow anything…I’m sure that it is due to the pesticides on the conventionally grown feed. 🙁 So I have a pile of compost in which nothing will grow! Another reason to grow organic! I’ll be by to check out your new photos today! This is a good article. Thanks for sharing. I just found a guy that grows grain in the area so I am buying from him. I like the idea of sprouting some, especially during the winter months. And I will be letting them free range when I get my garden fenced……which will be soon. Looking forward to that. I know they will be much happier when they can range. Thanks, Janolyn! How wonderful to buy from a local farmer! I need to check into this a bit more! You mentioned about having to eliminate a possum recently. Did that critter go into your chicken food routine? Have seen other articles where meat was added to the birds diet to up the protein levels. As much as possible, I cohabitate my critters. For example, my rabbit cages are in a corner of my large chicken pen. The chickens like to go under the rabbit cages to pick through the food and hay dropped by the rabbits as well as scratch through the droppings to find earthworms and other insects. Great idea 🙂 I only have poultry right now, but someday I hope to have more livestock and I’ll be doing this too. Thanks for sharing! Don’t forget to check out different suppliers. I was using a feed store close to me, but once our hot/ drought hit two summers ago they doubled their price, everyone did, but the price never lowered. Their being “out” for a week sent me to check a Mom and Pop feed store closer to where I worked. There the price was down, with the new growing season. I learned a good lesson, it pays to shop. My gals free range, and get lots scraps as well. Good advice. I have found the best price is my closest Mom and Pop feed shop too 🙂 Thanks for sharing! What a great article! I wish I had space for some chickens, but I live in Los Angeles. Some folks do have 2-3 chickens in pens and they let them out with supervision in the back yard to peck. I visited Wild Farm in Woodside, CA (see the episode of “Late Bloomer”), and she had 20’x30′ area inside her large hen area where she grew brassicas just for the hens. I thought that was so interesting. They could feast on them fresh, and the hot compost bins are there, too. Happy hen growing! Thanks, Kaye! You might be able to have a couple of hens…they make wonderful fertilizer for your garden. 😉 Just be sure they get organic feed. I’ve thought about growing a garden just for my chickens…somehow that hasn’t happened yet! Thanks for sharing! This article couldn’t have come out in better timing! I keep the feeder full in the coop so my birds can eat at all times right now. We finally put the fence up around the area where we keep our animals so they free range. I’ve noticed they go around eating grass and dust bathing but they come back to the coop to eat quite often. So I’m thinking about just feeding them once in the morning when I let them out to encourage them to forage more during warm months. And maybe they will be more interested in my kitchen scrap…? I’m also growing black seed sunflowers this year. I have to check into growing grains too. I think you’ll see a very big decrease when you start feeding them once, or even twice, a day. I give my flock food in the am and again in the late afternoon. The feed is usually gone in a couple of hours and I can see that the younger pullets are getting feed too…so they have enough. But they don’t have an all you can eat 24/7 buffet…which will also add to the fat in their body cavity and reduce the number of eggs they will lay. You might want to feed them in the evening. If they are fed in the morning, they will free range somewhat, but if they are hungry, they should be able to fulfill most of their needs if there is enough. When it warms up and there is something to eat in the pasture, I will try that. Thanks for the suggestion! Right now I am giving them the sprouted wheat grass first and then I wait until that is gone before giving them regular feed. Great article, Lisa. We’re concerned about the high cost of feed and do all we can to supplement our chickens diet naturally. Ours are in a really large pen where they able to forage to some extent, and we feed them all of our leftovers. We gather bugs that congregate in the water troughs, etc. and feed to them, too. When we eat out we gather up everything on the table they could eat and bring it home. I know that sounds chintzy, but our hens love it just the same. I plan to start sprouting grain for them in the fall later this year. Have a great week. That doesn’t sound chintzy to me at all! I do the same 🙂 on the very rare occasion that I eat out. I’m hoping to add to this list over the spring and summer. Thanks for commenting and sharing your ideas!